I am an Adjunct Instructor of Writing, English and Presentations at the Academy of Art University in San Francisco. Recently, I was an Adjunct Instructor of ESL, English, Writing, Literature and the Research Paper at Olivet University in San Francisco. 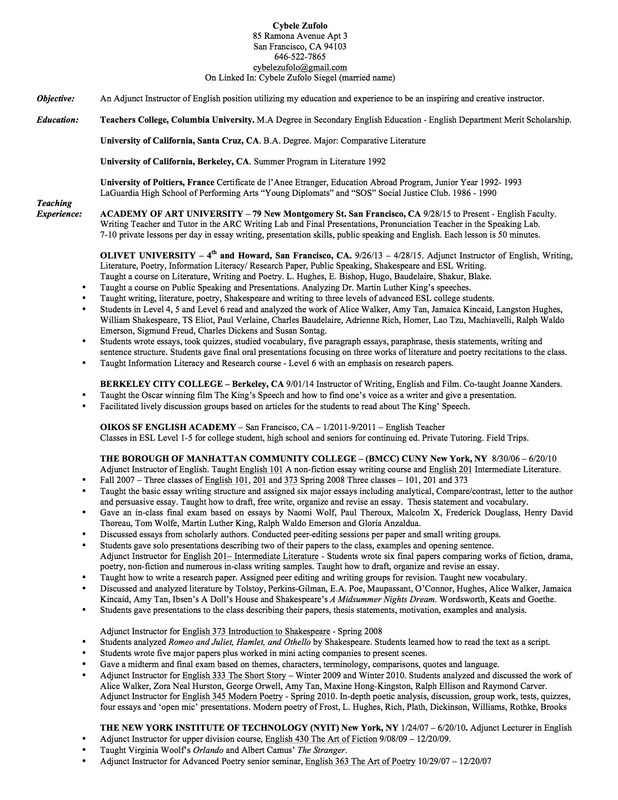 I am a former Adjunct Instructor of Literature, Writing, Poetry and Shakespeare from the Borough of Manhattan Community College, (City University of New York) the New York Institute of Technology and Pace University in New York City from 2006 to 2010. I bring many successful and wonderful years as an Adjunct Instructor of Literature and Writing teaching a diverse population of students. The courses that I taught at the Borough of Manhattan Community College were: The Art of Poetry, Introduction to Shakespeare, The Modern Novel, Non-Fiction Essay Writing, Intermediate Literature, Drama and Poetry, Modern Poetry, The Short Story, and English Composition 101, Writing 101, and 201 all with excellent faculty observations. My writing on teaching, called The Bard at BMCC was published in the Cuny College faculty journal in 2008 on teaching a Shakespeare 101 course to community college students from a diverse and multi-cultural setting. I received a grant from the National Endowment for the Humanities in Shakespeare studies in 2008. I enjoy watching students read literature on their feet and out loud, participate in class discussions and present their own essays to the class.